Profile: Slugfest is as lumbering and dim-witted as he looks. 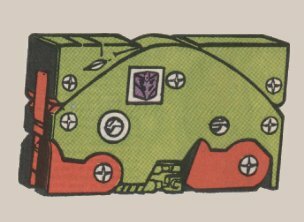 The Decepticons can only count on him to do the simplest of tasks, which means he's usually limited to carrying messages in his cassette mode. This arrangement would be fine if Slugfest wasn't so nosy. Invariably, he plays back the messages for himself before he delivers them, and then misinterprets them to be about himself. This sends him into violent rages, since he hates when others talk behind his back. At such times, he attacks anyone and anything, friend or foe. Only force or lack of fuel stops him. Very often the end result of one of these tantrums is the inadvertent destruction of the message he carries, as well as any small towns that happen to get in the way. Abilities: In cassette mode, Slugfest has a vast data storage capacity. He can record and store up to 1.2 billion bits of data via visual, audio and electrical inputs. In stegosaurus mode, he can use the armored plates on his back like the teeth of a chainsaw to cut through virtually any substance. He carries two side-mounted solar-powered vibro-cannons. When fully charged (after at least an hour's exposure to sunlight), the vibro-cannons can shoot beams of harmonic sonic energy that can shatter a bridge. Weaknesses: In addition to being slow and stupid, Slugfest is prone to jamming when he's playing back messages in his cassette mode. In stegosaurus mode, his leg joints often lock into place, hobbling or even immobilizing him.